If you’re shopping for a used car, you want to know what you’re getting yourself into. A number of companies sell vehicle history reports, to shed some light on the past of any given vehicle. Here’s what you need to know about the major vehicle history reports– and how to figure out which one is right for you. Carfax probably is the most well-known provider of vehicle history reports– and the most expensive. A single Carfax report costs $39.99, with discounted bundles of three for $79.99 and five for $99.99. But, despite the price, Carfax has established itself as the benchmark for all other vehicle history reports. Carfax is pricey but many think the detail in the reports are well worth the extra dough, with easy to understand data and user-friendly explanations. Unlike its competitors, Carfax also shows some maintenance dates and records. The data will only appear on a report if the car to a facility that shares its data, such as a franchised dealership service department. 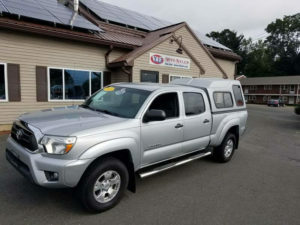 This information is a huge bonus, providing insight into past repairs and recurring issues, and how well the previous owners took care of the vehicle. AutoCheck is best known for their vehicle “scores” — a number and a range — like 85 out of a range of 70-90. The score shows how the vehicle compares to other similar cars built that year. While designed to help users quickly eliminate vehicles that might have issues, some users find it confusing. The AutoCheck Score scale isn’t zero to 100, like a percentage point or letter grade; some cars with high scores are train wrecks while other with low scores are totally fine. The vehicle score is nice as a nice added feature, but shouldn’t be a crucial piece of information in your decision. Price wise, AutoCheck charges $24.99 for a single report, $49.99 for 25 reports in 21 days, and $99.99 for 300 reports. While it doesn’t have all the bells and whistles of CarFax, AutoCheck is a good option, especially for shoppers who plan on running numerous reports. This database, run by the federal Department of Justice, is the only system that’s publicly available in the U.S.– and all insurance carriers, auto recyclers, junk yards and salvage yards are required, by law, to report to it on a regular basis. It’s not fancy and won’t provide any detailed reports but it is a fast, affordable way to check when and where a vehicle was registered. It can also help you find out if a branded title was issued– if that’s something you’re interested in.